When it comes to entertainment for my kids, I’m always looking for something fun and educational. 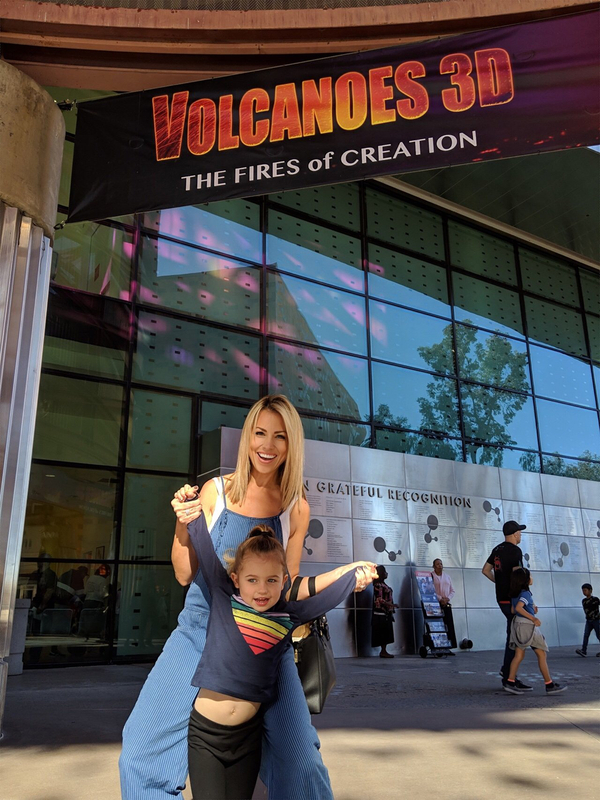 So when I saw that the California Science Center was playing “Volcanoes 3D: The Fires of Creation,” I knew I had to take Sophie to go see it! These days Sophie is asking more and more about the world around her, so I’m always trying to find fun ways to engage her in it. After taking a family trip to Hawaii, Sophie could not stop talking about everything we saw there, including the volcanoes. I thought it was perfect timing to go see the Volcanoes 3D movie! Volcanoes 3D is a movie that takes you on a journey of the history of volcanoes and all that they have created for our environment. The movie was so fascinating for both me and Sophie. I’ve spent countless painful hours sitting through movies or tv shows geared for kids, but this movie was different. I enjoyed it as much as Sophie did! She learned about how volcanoes have formed different parts of the Earth, and got to see it in action, on a seven-story IMAX screen! I’m so glad we got to learn about the history of volcanoes in such a fun and interactive way.